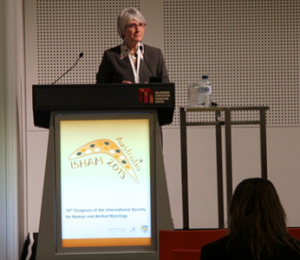 Today, May 5th at the ISHAM conference GAFFI has launched the project ‘95-95 by 2025’ at Melbourne in Australia, calling on all national governments and public health agencies to reduce the toll of death and blindness from fungal diseases. 95-95 means 95 percent of patients with life or sight-threatening fungal disease are diagnosed and 95 percent treated. Currently the figures are at best 50 percent and, at worst, as low as one in three. Significant advances in diagnostics for fungal pneumonia and meningitis have been made over the last 15 years, but are only available in a few countries. One key antifungal drug is amphotericin B, which first used in 1959, but it is still not available in 76 countries, despite it being critical for the treatment of fungal meningitis. Alternative antifungals drugs are either not available or are excessively expensive in many countries. GAFFI attributes part of the responsibility to those public health authorities and major health agencies that have failed to recognize the huge and avoidable toll of death and blindness, attributable to fungal diseases. The importance of chronic and allergic fungal infections has been overlooked for years, and will be responsible for over 500,000 deaths each year. Similarly, AIDS-related fungal infections are responsible for up to 700,000 deaths (nearly half the total number of AIDS deaths), and could be halved rapidly if diagnosis and treatment were made available immediately.